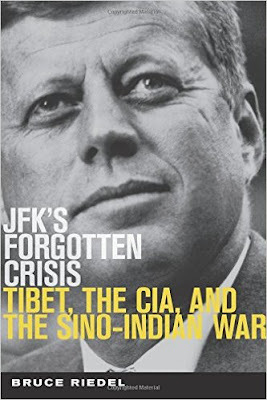 Veteran journalist and author Joseph C. Goulden offers a good review in the Washington Times of Bruce Riedel's JFK's Forgotten Crisis: Tibet, The CIA and the Sino-Indian War. In October 1962, the CIA’s discovery that the Soviet Union was shipping missiles to Cuba electrified world fears of nuclear warfare. Tedious negotiations by President John F. Kennedy, in which he agreed to withdraw U.S. missiles from Turkey, ended the frightening crisis. Virtually unnoticed by the public at large was a parallel crisis — a border conflict between India and China that threatened to escalate into full-scale warfare between the Asian giants. India was the aggressor, dispatching troops to try to settle a long-standing boundary dispute. Things went poorly for the Indians. An alarmed Indian Prime Minister Jawaharlal Nehru sent an urgent letter to Kennedy asking for 12 squadrons of supersonic fighter planes, with ground radar equipment, to fight off Chinese aviators. ... That the India-China conflict was halfway around the world meant the crisis lacked the geographic immediacy of Cuba. Another factor that shielded it from wide public view was that no one outside of official Washington knew of a top-secret CIA operation in Tibet, begun under President Eisenhower, that played a minor role in touching off the confrontation.